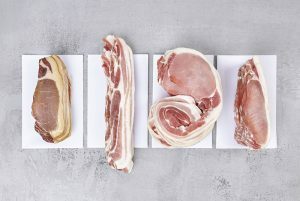 Bacon comes from the loin and belly of a pig – and this is either cured in brine, or dry-cured using salt. In the days long before you found a fridge in every kitchen, the curing process was designed as a way of preserving meat throughout the winter. The pigs would fatten up during the summer and autumn – enjoying roots, apples, household scraps and anything else which appealed to the piggy palate. According to folklore, the Gloucester Old Spot came by its well-known markings while snuffling away on windfall apples. Legend dictates that the Gloucester Old Spot was bruised by a falling apple one autumnal morning, and so came by those distinctive markings. The hind legs would be cured to produce ham: either a Dry cure Yorkshire ham, or a brine cure Wiltshire ham. The middle (loin and belly) would be salted down on a stone slab in the cellar under salt or salt petre (potassium nitrate). Salt petre is hard to come by these days as it is commonly used in bomb making. All the trim would be made into delicious sausages. After 2 to 4 weeks of curing, the meat would be hung to dry and mature. My father grew up on a farm during World War II and remembers hanging their meat in a cobwebby barn as the busy spiders ensured that the flies were kept well away from the precious meat! Henrik Blam, a German Prisoner of War stayed on the farm with my father and grandparents – he was a butcher and shared his expertise with my family throughout his time there. Dad still remembers Henrik receiving food parcels from his sister in America. My grandfather gave him cigarettes and fed him well – and in return Henrik worked hard on the farm. Meat cured in this traditional way would keep for months and months and would see families through the tough winter. The curing process is used to impart flavour, as well as a preserving technique and the traditional method produces a much saltier tasting bacon than our palates are used to today. Nowadays we enjoy a much lighter cure, which doesn’t taste as salty and nor does it keep as long – although now that most homes are blessed with a fridge this is not such a problem. The curing process is not actually necessary for modern-day bacons, however we continue to cure it as we like to use it as a means of adding flavour. Farmers Bacon – dry cure, full middle roll with its rind on and an old fashioned flavour. More like the bacon my Dad grew up with! The smell of sizzling bacon is well renowned for tempting vegetarians into enjoying meat again. Did you know that a pig born, raised and slaughtered abroad (e.g. Denmark, Holland) can be brought into Britain and cured. It can then be badged up as British Bacon. At Lishmans we ONLY use locally-reared pork for our bacon. We truly believe that Yorkshire pigs produce the best tasting bacon.